After rounding up some of Keely’s friends (huge shoutout to Serena, Laura, Olivia and Brooke! 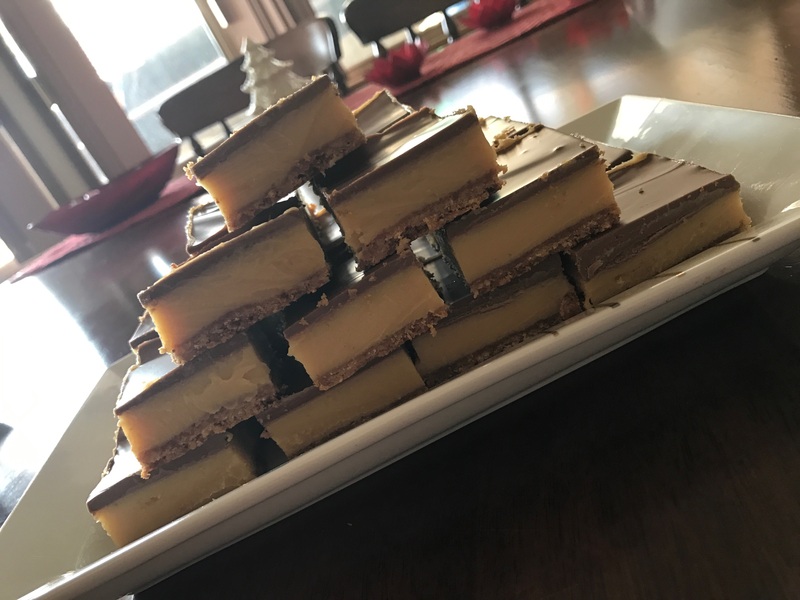 Thank you so much – this would’ve been so stressful without your help), we began baking four different recipes – two long time faves, caramel slice and chocolate brownies, and two newbies, sugar cookies and a pudding-shaped malteaser cake – to take on Christmas day for the family. Enjoy! Melt the butter then mix all the ingredients together in a bowl, then spread evenly in a tray lined with baking paper. Bake in the oven at 160 degrees Celsius for approx. 15 minutes (if it starts to bubble, remove from oven). Put the ingredients in a saucepan and melt over a stove top on low heat until the butter dissolves. Make sure to stir well so nothing burns. Pour over the base and bake for another 15 minutes (remove if it starts to bubble). Pour the topping on top of the slice. Place the slice in the fridge to set. Remove it once set to slice into squares. Put the chocolate, butter and cocoa powder into a saucepan, and stir until melted and smooth over a stove top on low heat. Place the sugar, flour and baking powder in a medium sized bowl. Make a well in the centre of the dry ingredients (like a bowl shape) and pour the chocolate mixture into the well. Add in the eggs then mix the ingredients until combined. Line a square baking tray with baking paper then pour the mixture in the tray. Put in the oven for anywhere between 30 and 55 minutes, depending on how soft you want your brownie. If you like more of a cooked brownie, the skewer comes out clean. If you like more of a gooey brownie, the skewer should come out gooey. Sift the flour into a medium sized bowl, then add the baking powder and mix them together. In a separate bowl, add the butter, sugar, milk and egg, then mix with an electric mixer. Add in the flour mixture and continue mixing. Divide the mixture in half and place into two large, separate bowls. In one bowl, add a dash of red food dye, and in the other a dash of green. Knead the dough with your hands until one dough turns red and the other green. Add more food dye if needed to make it your desired colour. Gather the red dough into a squished-ball shape and wrap with glad wrap and place it in the fridge. Do the same for the green dough. They will need to sit in the fridge for a little under 2 hours. After 2 hours, preheat the oven to 190 degrees Celcius. When you take the dough out of the fridge, lay down two medium sized pieces of baking paper on the table (not to go in the oven – just for cutting out shapes). Place the red dough on one piece of paper and roll it out (but not too thin as they’ll burn), and do the same to the green on the other. Prep baking paper on two trays. 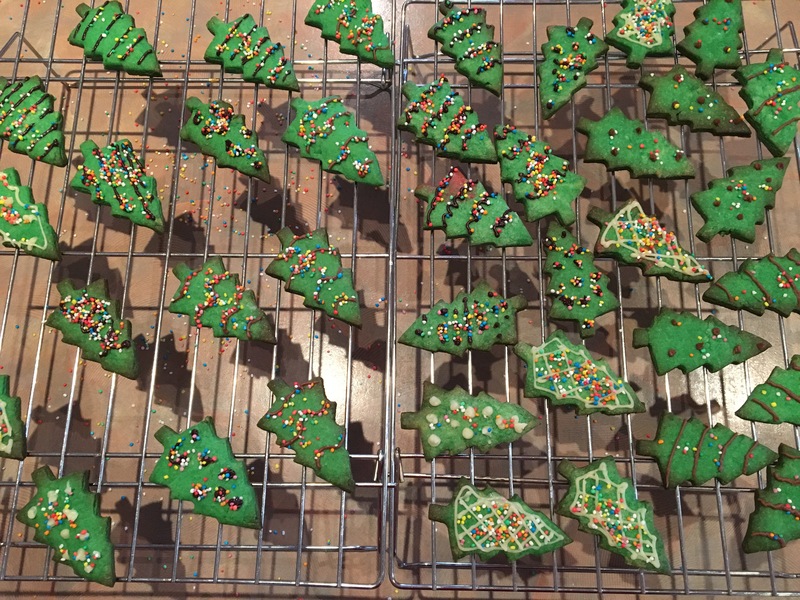 We found a Christmas tree and a love heart cookie cutter in the drawer and thought they were perfect for the cookies. We used the Christmas tree for the green dough, and the love heart for the red. Cut out the shapes, and place each finished shape onto the baking paper. Tip: to help cut the shapes out, wiggle the cookie cutter a bit before you remove it. When you’ve cut as many shapes as you can from the dough, roll the left over dough into a ball and roll it out with a rolling pin and cut out more shapes. Continue until there’s no more dough to cut out. Place into the oven for 9 minutes, turning the tray around at about 5 minutes – keep an eye on the cookies in case they begin burning. Let the cookies cool on a cooling rack before decorating them however you like, whether it’s sprinkling icing sugar on them or doing what we did and drawing patterns with writing icing and sprinkling 100s and 1000s on top. Voila! Two hours of cooling for only 9 minutes of cooking, haha! Grease a pudding dish with olive oil spray or something similar. In a saucepan, combine the butter, milk and brown sugar and stir over a stove top on low heat until the butter is melted and it’s smooth. In a medium sized bowl, pour the butter mixture in, then add in the cocoa powder and flour, whisking until combined. Whisk the eggs into the mixture. Pour into the dish and bake for approx. 55 minutes, checking regularly with a skewer. When the skewer comes out clean, it’s done. Let the cake cool in the dish until your able to get it out to cool on a cooling rack. Tip: if the cake it refusing to come out of the dish, go around the edges with a knife to give it some encouragement (preferably a fillet knife). Wait for the cake to cool completely. In a small saucepan combine the chocolate, cream and 30g of butter, stirring over a stove top on low heat. When the butter is melted and everything is smooth and combined, it’s done. Ta da! You’ve made the ganache. Beat the approx. 100g of butter (I say approximate because I got confused and just threw in a random amount and hoped for the best) in a separate bowl with an electric mixture until fluffy as possible. Add in the malted milk powder, icing sugar and tablespoon of milk and continue mixing. Beat in 1 and 1/2 tablespoons of ganache. Ta da! You’ve made the frosting. Leave the ganache aside for and hour and a half. This should make it thick and spreadable. Cut the cake horizontally into 4 layers, and divide the frosting evenly into thirds. On a plate, place down the bottom layer of the cake, and spread one third of the frosting on top. Then place the next layer of cake and put the frosting on top of that, and continue until your cake’s been put back together with frosting in-between each layer. Place the cake in the fridge for an hour and a half. Note: it’s best to put the cake in the fridge at the same time you put the ganache aside, as they take the same amount of time to cool/thicken. Once an hour and a half has passed, spread the ganache evenly around the sides and top of the cake. Then place the Malteasers on the ganache, working in rows from the centre outwards. Important note: the Malteasers may slip and fall down the sides of the cake, so feel free to pop the cake in the fridge for a minute or two so the ganache can harden a bit, then decorate. You can even do touchups with the Malteasers while it’s in the fridge. Finally, pour some melted white chocolate over the top of the cake then let it drizzle down the sides so it looks like a pudding, then sit the cake in the fridge to cool and harden. Add a sprig of decorative holly on top as well.